If you have spent any time on our websites getting to know us, you already are familiar with our mission and interests. In a nutshell, our work (our lives really) revolve around historical horticulture. Seed variety preservation is the primary focus of our work but many other pieces harmonize to allow this work. For example, in order to research and document the histories and pedigrees of old plant varieties, as well as the companies that released them, we have build a pretty good collection of rare books, seed catalogs, agricultural bulletins, and other related documentation. A dream of mine is to someday get the collection digitized and available for other researchers, but I digress. We aren’t the typical seed company that simply purchases from the mainstream international seed industry and repackages. We live, raise seed and operate the company from a multi-generational family farm. In terms of modern farming practices where thousand-acre, mono-cultured corporate farms are the norm, at just under thirty acres, we are tiny. Even though mainstream agriculture, in the form of agencies and media, tell us that small farming is not sustainable, we actually believe in our hearts that the exact opposite is true. History proves this. We do not see our size a limitation. By being on a small farm, it has meant that myself and my ancestors have always been challenged to be creative to remain successful and relevant in our community. That is, we resist the human nature tendency to simply do things because, “that is how they always have been done.” Instead, diversification, adaptation and change have resulted in our farm remaining viable and productive, in spite of our physical land boundaries. A little insight into this adaption process comes from a current bit of research and experimentation that I have been doing. It stems from the fact that we are trying to raise more and more seed in bigger and bigger quantities and our old, manual methods are no longer able to keep up. For very small farming (or extreme gardening), using pre-industrial age tools and a lot of sweat works fine. However, at a certain point, you can simply plant too many beans to tend, harvest and clean by hand. Just ask my family! In the past, our volume was such that it was a simple task to do it completely by hand. But as I have increase planting amounts, family members have grown up and left the farm and in spite of the recession (or depression or whatever it is we are all in), the labor rates continue to rise here in Oregon. The solution to this is mechanization and automation. But as previously mentioned, modern agriculture is focused around large, mono-cultured farming practices which means that equipment manufacturers make tractors and implements that are huge, specialized and expensive. So over the past few years I have been researching old, pre-corporate farming methods. For a (very) brief period early on in my studies, I romanticized about farming as people had done for thousands of years using draft animals. (Perhaps I will revisit this when I retire someday.) But since I do not have the “luxury” of simply farming all of my waking hours (I do have to fit operating VSC into my schedule), farming with animals would add additional chores, expenses, responsibilities and not speed up tasks all that much. It was in my research that I realized that if there ever was a “Golden Age” for small farming, it was just past the “Twenty Acres and a Mule” era, right around the middle of the 20th Century. It was during this time that the equipment manufacturers were improving, mechanizing and building on the Industrial Age innovations of the late 19th Century. The result was the production of farming machinery perfect for ten to twenty acre farms. So, time permitting, I have been trying to find affordable, older equipment that still has serviceable life left in it that we can get put to use here on the farm. This past week I was able to acquire not one but two new (very old ) Farmall Cub tractors that are set up for row crop farming. We have had a Cub since I have been here but it was set up for tillage (plowing, discing, harrowing) so it was rarely used. The last time I used it was to mow a field that I once used as a pasture. The new Cubs are set up for cultivation! 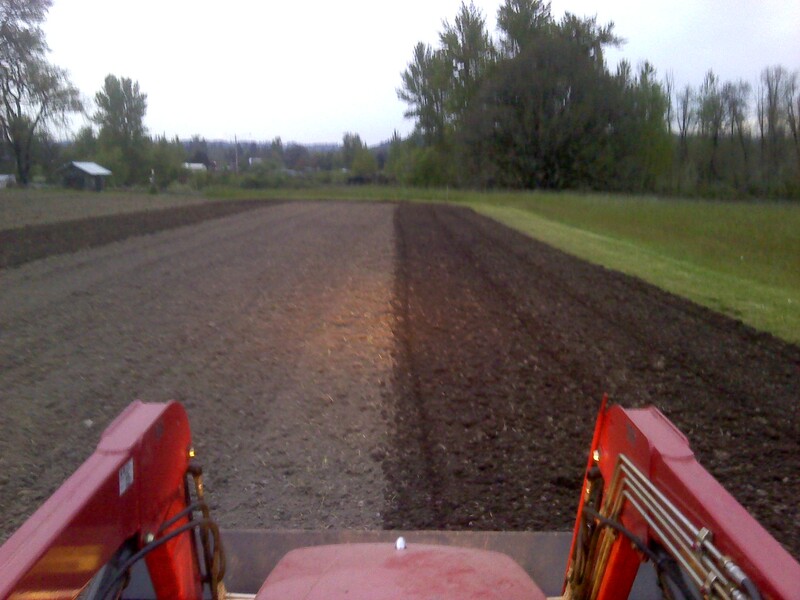 One is set up to hill and cultivate a single row and the other is set up for two, closer together rows. If I can figure out proper spacings for next year’s garden layout, the plan is to use them for replace the task of hoeing things like beans and corn. If you are curious and want to learn a little about old Farmall tractors, click here. You also might be interested in the harvester that I found about this time last year. I hope to begin trying out various heirloom grain varieties in the future. My Office View and Thank You! After a long day working outside, I packed up the family plus two workers who were here late, and we headed down the road to the local cafe for supper. It was nice to unwind and visit as a family over a good meal . . . especially when there were no dishes to clean up afterward. When we got back to the farm, the guys (son and both son-in-laws) headed to meet up with friends to play basketball. I started to head out to the office to catch up on paperwork but it was so nice outside, and with rain forecast for tomorrow, I grabbed the tractor key and a sweatshirt and hit the field. I ended up tilling the gardens until 10:30 p.m. this evening. Doing tractor work is one of those tasks that allows you to simultaneously work your mind. It is kind of like time spent commuting. And yes, I too once had a commute. Commuting seemed like dead, wasted time. But like this evening on the tractor, I always tried to make the time productive. I started with going over the day’s accomplishments and what didn’t get done. Then I started making a mental list of what I needed to get done this weekend and then I started thinking about the weather. Then started watching the flock of birds that was following me around the field eating as I turned the soil. Well you get the picture . . . my mind started to wander. But that is o.k. once in a while. It is like dreaming. A necessary function. And then, as I sat in the armchair that is my tractor seat, I looked up and took in the whole view as well as my situation. And it was good. It was like it just hit me. After years working off-farm in a corporate, high tech career to pay the bills while we got the farm and the Victory Seed Company off the ground, I finally got my office with a view. It is awesome and I am grateful and very appreciative for all of you that support our seed variety preservation work with your orders. Your support directly allows me to work the soil, raise rare seeds and keep them available to gardeners. I truly feel blessed and just want to sincerely thank you.